While it’s always great to pick the winner of the AFL Brownlow Medal, most punters will make their money from other Brownlow betting markets. That’s especially true when we have a $1.60 favourite like we do this season with Hawk Tom Mitchell. The tomato sauce odds are hard to get excited about but there’s still plenty of value to be found on Brownlow Medal night. We’ve already taken a look at the Team Voting and Leader After Round markets and provided our Brownlow betting tips for those markets, and today we’re going to look at some different group and head-to-head bets. These markets do tend to come and go on the various Australian sportsbooks. They release markets at different times, and prices are often snapped up quickly. So please keep that in mind if you can’t find the same markets or price available – make sure you shop around! Make sure you check out our full 2018 Brownlow Medal leaderboard, including analysis and tips for every round of the season! We like the look of Lachie Neale (15) to win Group E over at the TAB. He’s up against De Goey (10), Cunnington (10.5), Heeney (8.5), Lambert (10) and Tim Kelly (11.5). With Nat Fyfe missing so many games, Lachie Neale is primed to poll well and it’s hard to see one of the challengers in this group over-polling and challenging him. We’re going to take on Dangerfield which might be a dangerous move given his previous Brownlow success, but we feel he was down on form this season and if the umpires mark at high standards for him, then we like a couple of others to beat him. 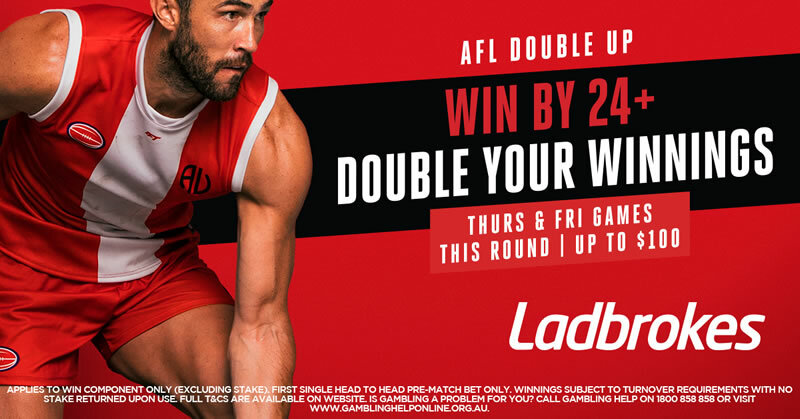 On Ladbrokes, Dangerfield (14) is the favourite which is giving us a great price on Brodie Grundy (20.5) and/or Steele Sidebottom (18) who we both have well clear of Danger. Others in the group include Ablett (15), Higgins (14) and Selwood (11). Take either or both at those prices. Lance Franklin (14.5) is a great horse to back on Brownlow night as he is such an eye-catcher and so influential in games that he often over-polls. Here in this Forwards group, Buddy is up against Brown (8), Breust (6.5), Darling (8.5) and Riewoldt (8) and you’d think he should have their measure. Note: Unfortunately since writing this article, the price has been crunched. He still looks a winner, but be careful chasing short odds. We have Laird as a comfortable winner against Selwood. Laird is a chance to poll up to 6 votes within the first 3 rounds, and is a chance to poll in as many as ten rounds. His possession accumulation helped him to stand out when a lot of Adelaide’s mids were injured. On the other hand, Selwood didn’t have his best season and has to compete with a plethora of midfield stars for votes. We only have Selwood polling in six games, so happy to take the price on Laird head-to-head. Another option is to take Stephen Coniglio (18) against Selwood. We do have Coniglio polling a little higher than popular opinion, but there’s still a large gap over Selwood. The only problem is you’re only getting $1.62 at TABTouch. No doubt Matt Crouch is a ball magnet that is going to catch the eye of umpires, but he missed so many games this season, so I think this is a great spot to take him on. He won’t poll until Round 15, and likely has a maximum of five games where he can find votes. O’Meara is almost the opposite. He’s going to find it hard to get any maximums due to the presence of Brownlow favourite Tom Mitchell, but O’Meara had great consistency this season and could poll in as many as seven games. We have him picking up enough votes to have a gap over Crouch, and when we’re getting an underdog’s price, this is worth a play.